Escape prison, reach the base of the Iron Lord's fortress and solve the mystery of his power! 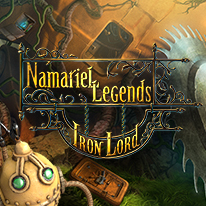 Upon the prosperous nation of Namariel descended the terrible Iron Lord. And with the help of a legion of mechanical soldiers, he conquered it very quickly. Be the one to face the dark ruler and destroy the source of the Iron Lord’s power. Exciting adventures, the true courage and mysterious world await you as you emerge into the unique fantasy world...if you're up for the challenge!